I have always enjoyed skating and took it up quite seriously several years ago. But, when life happens it happens big for me, as it did in 2000. We were in a car accident that left me with a back injury. It was completely debilitating for almost 5 years. It was impossible to even bend over to put shoes on. One day I decided that the only way to get better was to make it happen. I found a great Chiropractor who put me on an exercise regime and so thus began my road to recovery by increasing my activity levels very gradually. I seriously began with 2 lb weights on a chair and would pick them up and stand, this was the first routine: a set of 10 lifts, 3 times a day combined with gentle, very gentle, stretches. It just got better from there. I have since recovered from that brief episode of pain and inactivity and have taken up many different activities in an attempt to be strong and healthy allowing me to be active and much much happier and more satisfied with life in general. last week I talked about how I am somewhat "carless" this past little bit, so Flat Stanley and I have been going all kinds of places by bus and by walking. including the grocery store, church, or visiting. It was either that or go nowhere at all! On my day off we decided to go ice-skating. Flat Stanley is very excited and ready to go! This is my collection of ice-skates! all different sizes and qualities. Stored away, just in case someone is over and needs to borrow a pair, mostly just because I hang on to too much stuff, and a little for sentimental value. the pair with dark pink socks and the teal socks were actually the daughters skates when she too was beginning to learn how to skate. In the summer this is a park and community baseball field. It is just a short distance from my house. In the winter, they turn it into a giant ice skating rink. It's a little lumpy, but it is frozen and a very interesting experience to skate outside under the clouds and in the fresh open air. When I first started skating I remember complaining that I couldn't skate because the ice was "too chewed up" from the hockey players that practiced right before the public ice time. Then I began coming here in the winter. 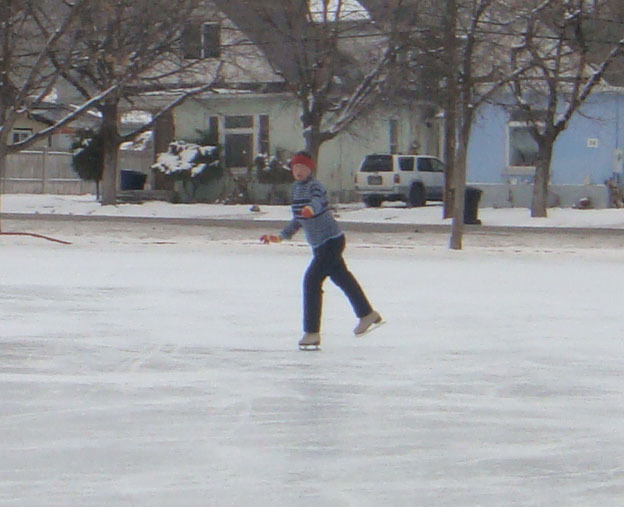 If you can skate on the park rink, you will be able to skate anywhere! They make the ice rink by packing down the snow by driving on it with their trucks, then they get out the fire hoses and spray, spray, spray until it layers up enough to make a flat sheet of slippery ice. Of course it has to be cold enough to turn it into ice. Once it starts to melt, they can't start over. So the community uses it and appreciates it as long as we can. It takes about two weeks after the snow has been packed down to make the ice rink. Because I'm here fairly early in the day I started out with the ice to myself. Kind of fun, and good, when a skater is as rusty and wobbly as I am for my first skate in a very long time. It's been a couple of years since I've had skates on and too many since I've skated seriously. While I was a bit hesitant to actually get on the ice, it slowly started coming back. I remembered how to go backwards, change directions from front to back, spins were a little off which made me kind of dizzy, well, let's clarify, A LOT DIZZY. I didn't get brave enough to try a 3-turn, or anything else fancy, that will have to wait. Oh how I love the feeling of floating on the ice, there is no place on earth to get that floating, flying feeling. . . . exhilarating, amazing, you feel like you are floating on air! Even when you are slow. I was thinking that I should come and do this more often and get my skills back. . . good memories. 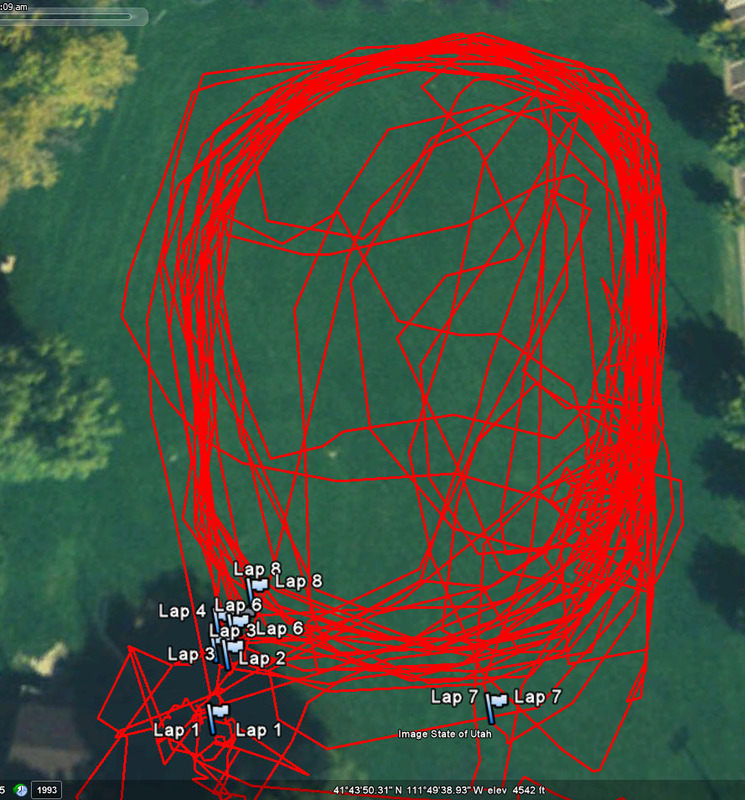 Thanks to my GPS device, the one I use for cycling, and to Google earth, you can easily see our loopdy-doops around and around the rink, over, across, back and forth and around again. Only Google earth took their picture in the summer, this is actually white with winter snow right now, as it shows in the actual pictures I took. It is exactly .1 miles around the rink, Flat Stanley and I skated 4.8 miles today, burning a whopping 385 k-cals. Like I said, I was a little uncertain getting going and while it was better by the time we left an hour later, I was still slow and rusty, and to be honest, most of those calories were probably used up on the walk to and from the park, the skating distance is accurate though. At night they light up the ice-rink and lots of people come skate. My apologies for such blurry pictures, I'm not sure if my camera was fogging up because of the cold, or if I was just cold and couldn't hold the camera steady. What a great date night activity! Someone once said that the most romantic place for a date is on the beach. (let me clarify something here, no it's not me in the picture!) While that may be true, the open outside crisp clean air of winter on an ice-rink might be a close runner-up. If I ever have the opportunity to do either, or even both, for a comparison, I'll be sure to let you know my personal opinion. For now, this couple seems to be completely absorbed in their activity. This is inside the warming hut. they keep a fire going in the coal stove, that resembles a train, so skaters can go in and warm themselves up and have a treat or cocoa if they bring some. It is very common for youth groups to come here for a fun activity idea in the winter. This is the fire hose that they use to spray the rink at night. Unfortunately the weather warmed up the day after these pictures were taken and because I am currently without a car I was unable to get some awesome pictures of them brushing and spraying the rink at night. (it's just too far to walk at night, and the buses don't run that late) Watch for next year, and I'll get this process on the blog. The rink is one wet sloppy mess right now, and with temperatures in the mid-to-upper 30's the rink was very short lived this year. Some years it survives until mid-February, then there are some that they don't even get it going at all. It's amazing what you miss while driving from place to place in a car. I wish this picture was a little better, but I use what I have. 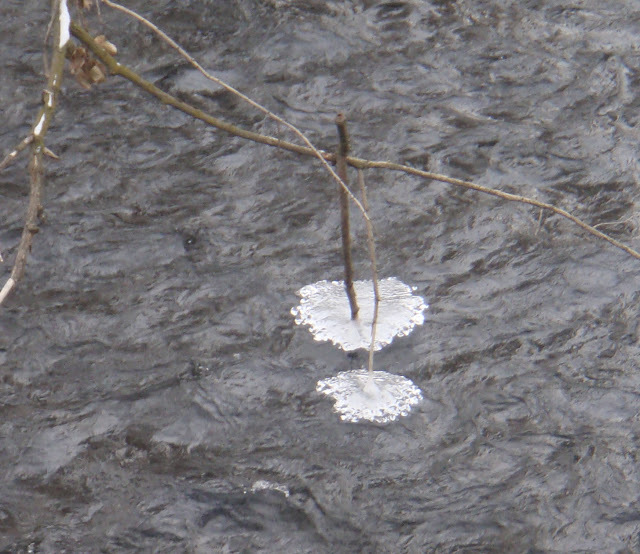 This is a river that goes through my town, and these two branches hanging down have been collecting water vapor and now are two suspended icy umbrellas from the tree just inches above the water. The second branch is just hanging there, it's not part of the actual tree, it just got caught on the main tree. This frozen little stream still has water running under it. The sun peeked it's head out for just a minute and let us experience the fresh white snow bathed in sunlight. . . isn't it beautiful? This is where the frozen little stream going to the river started from. Well I'm home now, it's been a great experience walking from here to there. . . . . .Thanks for joining me today!